A while back, I wrote how Keri Smith's article in HOW magazine inspired the heck out of me. One of the things she says is to find something you love and believe in. "It's as simple a letter saying, 'I like what you're doing. Can I be involved somehow? Here's what I do.' "
In that spirit, I contacted a new favorite magazine of mine, Kiwi Magazine. It's for families that are trying to live as healthy and organically as possible. I wrote them a note saying what a fan I was, and that my artwork was exactly what their magazine needed. I pointed out that not only did I make great illustrations, but that I lived the spirit of their magazine and that I would be perfect for them. I sent them over a bunch of links and images, including my old favorite "Balance" that I did for Illustration Friday almost exactly 2 years ago. I sold the heck out of myself, and then I was so excited and nervous, I couldn't get to sleep. But seriously, what was the worst thing that could happen? They already didn't have my illustrations in their magazine, right? I heard from them the very next day! And interestingly enough, two of the people who worked on the magazine went to college with me (If that isn't synchronicity, I don't know what is.) So "Balance" is in the issue that's on the newstands now; and I'm working on another brand new one for the next issue! I could not be happier that I'm doing something I love and that I feel so strongly about, and helping to get the message out that you can try to make healthy decisions for your family without killing yourself over it. 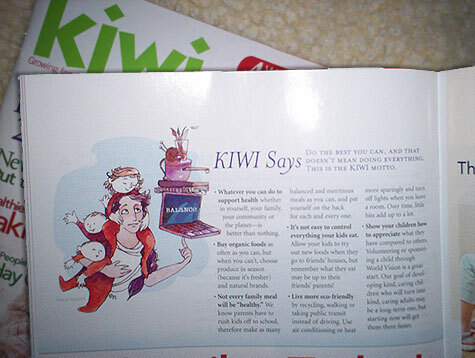 :) In fact, I'm really psyched that the illustration went on the "Kiwi Motto" page, because I totally agree with it. You can get the real thing by checking your local Borders or here. Has anyone else taken a leap like this? What happened? What could happen if you weren't afraid to try? If you just said yes?